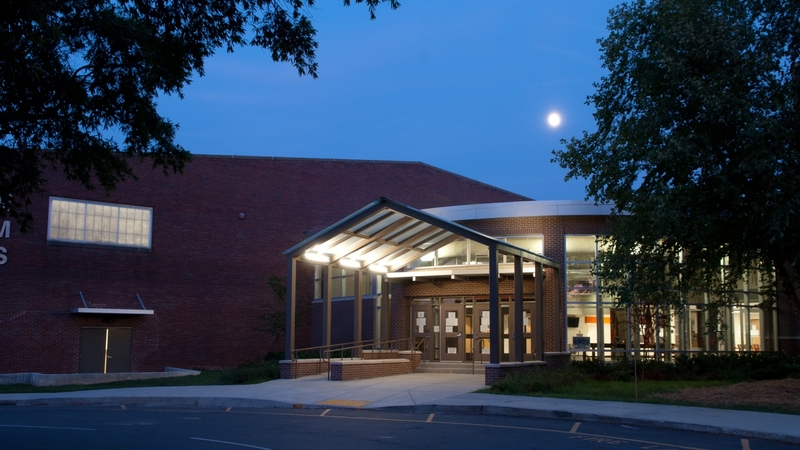 Madison Middle School Renovation and Addition consists of approximately 100,300 square feet of existing building space and 6,000 square feet of new construction. The school, which operated as Madison High School from its construction in 1951 until 1986, has been overhauled from top to bottom. Some of the key improvements include a two-story entrance lobby with full-height glass curtainwalls, enlarged cafeteria and new kitchen, floating ceilings in the library and all classrooms, as well as a new energy efficient heating and cooling system. The project incorporated many sustainable design strategies and received LEED Silver Certification. One focus of the design was to utilize the large existing window openings in the classrooms and library to provide ample daylighting and views for core learning spaces. Air-handling units serving each classroom were located within the plenum space in the corridors to reduce noise infiltration to learning spaces. Ductwork was lined to further reduce noise pollution and Merv 13 filters were installed to promote a healthy indoor environment. Over 75% of the construction waste was recycled and more than 20% of the interior materials specified and installed contained recycled content. In addition, 20% of the interior materials were comprised of raw materials that had been extracted and manufactured within a 500 mile radius of the project site which decreased the embodied energy to produce and install those products while stimulating the local and regional economy.